It is hard to say,why I dont make a visit to such a dream binocular telescope in last five years! This time is a impromptu visit,so when we arrival it is 11PM and we no time have a binocular observation. Even with tiny fog and seeing not good,the single tube have a great view too! Before the seeing became unacceptable,I have more than half hours shoot to Jupiter. After that,then have a look at full moon and Saturn. But the Mars too late,we must go home. Anybody remenber the milestone of Mars in SHENZHEN two years ago? For DOB22, the 12" tube is samll,but for Refractors it is not.For the binoculars? Just WOW! 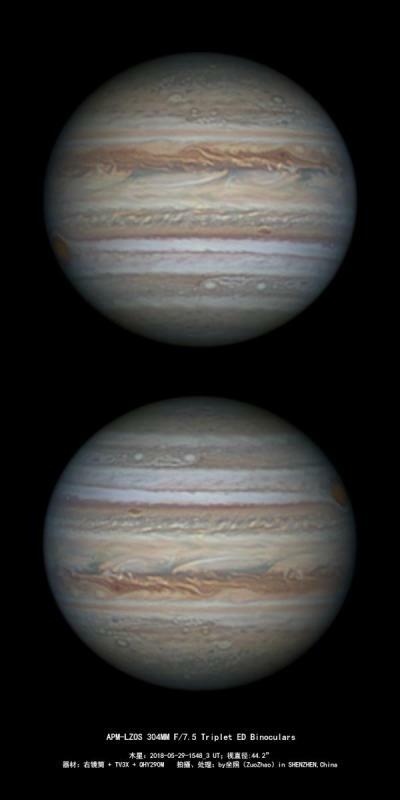 Now,this is the very first acceptable result of imaging in public by this dream telescope. I suffer focus in hand(!) and seeing condition. Even the feather touch could not equal to such a huge monster. Five years, a magical miss and a happy tour at last. Edited by ZuoZhao, 04 June 2018 - 10:31 AM. en? The photo become small in CN. But not change too much. 800X1600 to 600X1200 now. Wow! Wish I had views like that. Truly outstanding Binoscope! Is this it here? It's latest ready in 2013,and latest settle in 2015. I hope it can ready for Mars 2018. Interesting, and very nice images. What is the benefit of binocular setup for imaging? Pretty nice image ZZ - & a pretty nice scope also! Are you taking it home with you..? Good to see you posting here again! Less benefit,since no way to take two tubes in one shoot. But,we can take two videos in same time! Thanks. Do you have a plan visit SHENZHEN? I've told Sam (WenJha) that we might go to Suzhou - & of course a good look at various parts of your country would be a good idea if we did - we are getting old, but you never know ZZ..! real cool user name i love it and those images are superb must be nice to image with one scope and observe with the other. anyway you can get an image of mars in the future? Well... rainning now. Just waiting.